I am VERY PROUD of my 老二! He got his very FIRST badge - ATTENTIVENESS! After a term, the form teacher select the students whom she thinks deserve the badges and she will hand over the list to the Character Education teacher. The badges are then given out by him. Z kept his promise to me and to himself. 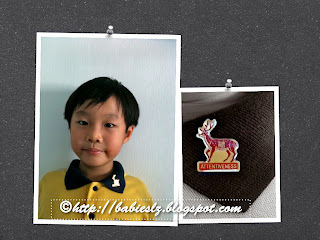 When he was in K2, he saw his sister had 5 badges and told me that he wanted to get it too. I must stress it here that I do not pressure my children to get any of these. He also said that he wants me to be very proud of him and he said his teachers praise him very often. So far, he seems to be doing very well in school and I will know more when it is time for PTM. Yes!! My rascal, mommy is very PROUD of you! In the box: Beef pasta and fruits not in the pic. It took me some time just to make this little girl. I need to practice more on making egg sheets and it is not as 'smooth' as it should be. 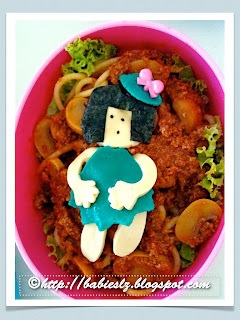 The little girl is made up of coloured egg sheet, cheese & seaweed. In the box: Fried eggs with beans, sausages, fried pork with chinese pickles, steamed corn, dragonfruits and rice. I like to cook for my babies what I like to eat since young, the pork fried with Chinese pickle is one of my favourite dishes (that my mom cooked). It is a very simple dish and I like to cook it when I am lazy too. My girl finished almost everything except one of the cute little face shaped rice and the steamed corn. 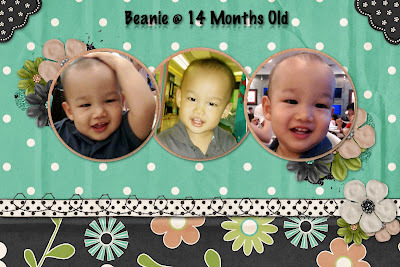 I believe good manners should starts young and I have recently taught Beanie how to say 'please' and '谢谢'. Why I taught him to say '谢谢' instead of 'Thank you'? Obviously it is easier it in Mandarin. He tries to say it (babbles) and nodding his head at the same time. So cute! Here's a video of Beanie's conversation with his sister, L. Love the way they 'talk' to each other! L is a very sweet 姐姐. She takes very good care of her brothers. I have plenty of video clips of my kids together and I am sure they will have lots of fun watching them when they are grown ups. During my younger days, we don't have such things to record down all these wonderful moments so I don't want my kids to miss out any of their growing up life. Hope you enjoy the video as much as we do. L is not in the video but you can hear her. Now that she is older, I try to post less of her pics and video clips in the blog. But that doesn't mean I have less pic or video clips of my princess. In the box : Garlic bread, teriyaki chicken wrap & flower shaped dragonfruits. I punched castle shapes onto the seaweed and it didn't turn out that well. It looked like I tore it... 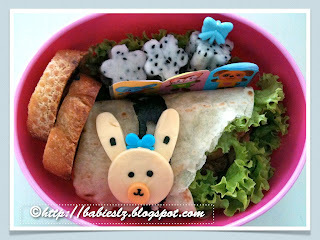 The bento looked plain again so I made a bunny shaped cheese and placed it on top. A simple meal prepared for my princess. The portion was just right for her to finish before recess is over. Z had these for lunch as well with his favourite cream of mushroom. ♥ He enjoys eating unless he is not feeling well. ♥ He is slowly showing his preference when comes to food. Nowadays, he doesn't like porridge so I seldom cook that for him. 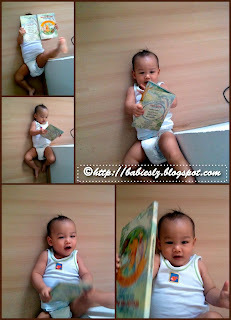 ♥ He loves to flip through books and he can spend abt 5 mins on his own flipping through it. I hope he will enjoys reading as much as his siblings. ♥ He enjoys kiddy rides and gets excited when he sees one. 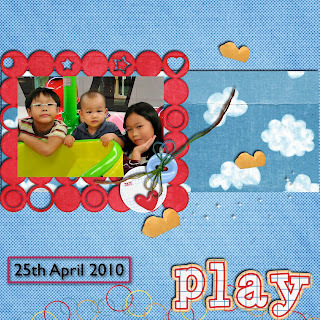 ♥ On 1st April - I left my hp in their room, my phone rang and I didn't hear it. I was surprised when Beanie passed it to me when it rang! ♥ He loves making loud noises!! He uses whatever is in his hands during meal time and starts banging! I try not to let him do it as I worry it will become a bad habit of his. ♥ For nap time, sometimes he will be able to sleep on his own hugging Woofy. Picture at one of the malls kiddy rides area. They wanted fried rice for their lunch and volunteered to help me. 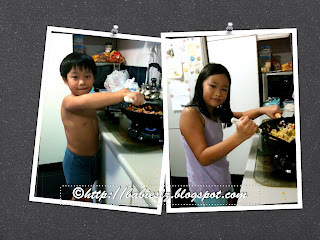 We had so much FUN just cooking fried rice! We may have a helper at home to help me with the cooking (honestly, I rather cook it myself coz my helper is more of a hindrance than help), but I like my kids to learn to cook as well. In the container: Udon soup with Stitch fishcake, asparagus & golden mushroom. 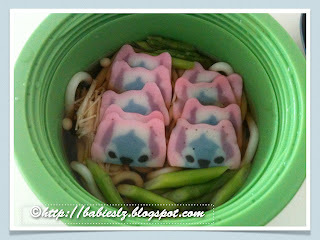 Z wanted something soupy for his lunch so I prepared udon soup for him. A very simple meal that he finished it within 15 mins. I like this container, it keeps the food warm and it doesn't spill at all when I send the food to him. My little boy feels restless usually when he is about the finish his meal. Today, he decided to be a drummer and made so much noise! In the boxes: Chicken burgers, orange (Z), strawberries (L) and grapes. I am sure you can tell which bento belongs to who right? Z's bento has that little crown food pick and L's bento has that ribbon. 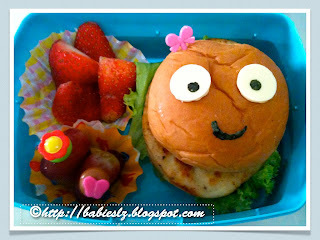 I thought the burger looked kind of weird with the big eyes but my babies love it. I could have used just the seaweed but I wanted the eyes to stand out so I used cheese as well. Meet Mr woofy! Beanie's sleeping companion. Most of the times, I have always been nursing him for nap or bedtime, till he falls asleep. Since Beanie is in a very good mood this afternoon, I decided to try letting him sleep on his own. I put him down with Woofy on the bed and told him Woof want to nap with him and he needs hug. Beanie hugged Woofy and turned to his side (pic). Then he turned and gave me a smile and back to hugging Woofy. I sang 2 songs for him and walked out of the room. Few minutes later when I checked on him, he fell asleep! AND he was still hugging Woofy! Yeah! I nursed him after he woke up from his nap and praised him for being such a good boy. It is a good start! Hopefully he can get used to this new routine. For night time, I still love the idea of him falling asleep in my arms. In the boxes: Peanut butter (Z) & strawberry jam(L) sandwiches, quail eggs. grapes and each has a fruit puree. These bento were prepared in a rush so it didn't look that good. LZ tried the fruit puree at the supermarket yesterday and they asked me to buy it for them. They requested to have that with their today's bento. 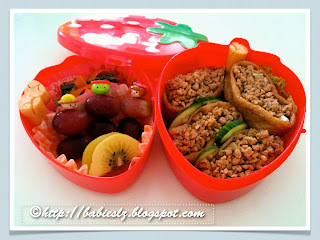 In the boxes: Sausages, spinach with carrots, grapes, golden kiwi, inari with minced pork. 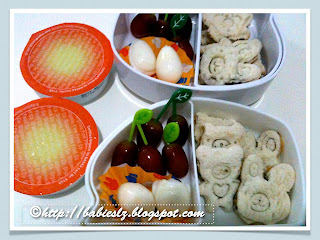 It has been some time since L had inari for her bento so I prepared some for her bento lunch today. Beanie lies down wherever he wants to and sometimes in the kitchen too! These pics were taken while I was at the computer and he was feeling lazy (I think) and simply lie down there playing with the book. In the box: Fried rice with pork, beans, carrots & corn, papaya and grapes. 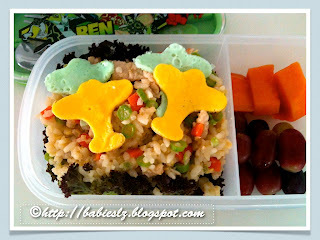 My rascal asked for his favourite food, fried rice for his bento lunch and he never get tired of eating it. He loves fried egg also so I added in 4 plane shaped eggs for him. 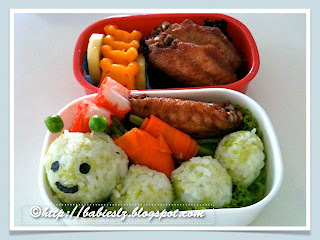 In the box: Pooh shaped mango, kiwi, prawn paste chicken wings, beans rolled with carrot, rice & crabsticks. In the box: HK shaped mango, kiwi, rice, prawn paste chicken wings, crabsticks and broccoli. 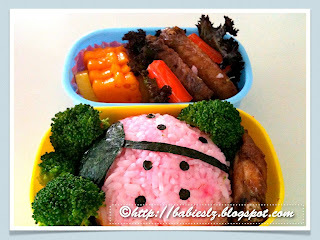 Both bento consist almost the same thing except that Z has beans coz he doesn't like broccoli. He will only eat that if we are at home. Usually for his bento I use beans, peas, asparagus or spinach which I know he will eat it without me around. 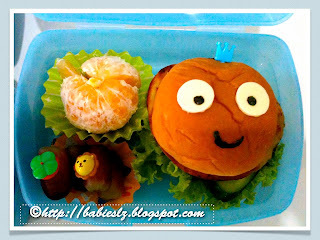 I decided to prepare a bento for Z today since I am preparing for L.. My boy saw the caterpillar I prepared for L the other day and said he wants one too. They had their lunch outside the school before L went for her extra lesson in school. I spent quite a lot of time preparing the 2 sets. I didn't want L to have caterpillar again so I did a ladybug for her. Hmmm... I like what I did today and LZ can tell what they were. 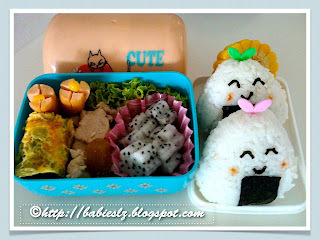 And these bento-s are my favourites too!